Swanee and I hit the 2010 Viva Las Vegas with one goal. 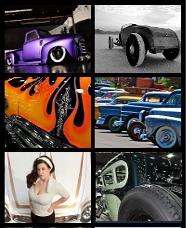 As #13 in a series, Viva’s a show for hot rods and customs with a strictly vintage feel, so we wanted to shoot tons of great hot rods and pinups. Done! Ang hooked us up with poses that flat MADE the shots. Girls looking for posing lessons, take note. This 1957 Ranchero’s easily one of my favorites from the show. Clean, low, wide-open-beautifulness. As Pinup of the Month, we add a little bio info. Here’s something you didn’t know: Ang is a self professed nerd. She says she spends too much time on the computer (reminds me of someone) and enjoys using Photoshop as well as being the subject of the photo a model. Ang is a Norcal girl originally from Oakley, CA who spent many summers on the nearby “Delta” wake boarding or simply “holding down the ice chest”. I grew up near the Delta too and remember my days trying to ski over huge wakes let off by the bigger bay running boats. Letting go of the rope, the smart thing to do, was never an option. There were girls like Ang around! Want to see more of Ang? It’ll be easy. She’s actively modeling and has a fun blog at 107.7 The Bone, a radio station in the bay area in Cali. Read more about her and see what she’s up to HERE. You can also follow her: Notorious Ang on twitter. The best place to see more of her work and book her for a future shoot might be at her Model Mayhem page here. It was our pleasure working with Notorious Ang. Thank you! How do you like our pics? Please leave comment and tell a friend. * Hello Viva Las Vegas 2010! i saw miss Ang before the show started. WHAT A DOLL!!! what is it with these otherwise attractive girls and those #$% tattoos?!? [definitely not vintage in look or reality]. love the pretty girls and cool cars – spare the ink please! You gotta be kidding about the ink. Wouldn’t have it any other way.